Only three days of its release, "Traidora" reaches 1 million views on YouTube | Cuba Headlines en Español – Noticias de Cuba, Noticias de Última Hora en Cuba y el Mundo. 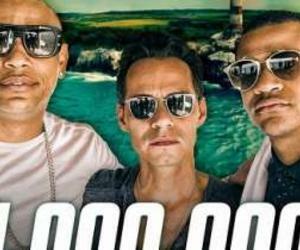 The video clip "Traidora", by the popular Cuban duo Gente de Zona with the Puerto Rican singer Marc Anthony, today reached 1 million views on YouTube in just three days of its international release. Again, Randy Malcolm and Alexander Delgado, the most famous duo of Cuba, mixed with the powerful voice of Marc Anthony and exceed the expectations of its audience, a few months after the premiere of "La Gozadera" Latino hit. Directed by Cuban filmmaker Alejandro Perez, the clip tells a story of unrequited love that involves the rivalry between the three singers for a girl who met in childhood. A Caribbean landscape, sea and a lighthouse on a deserted island, are some of the aesthetic features that accompany the plot. "Traidora" is already at No. 18 on Billboard's Hot Latin Songs and Latin Airplay list.